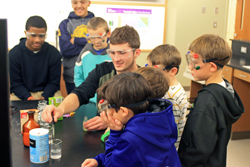 Cazenovia College and the Community Enjoy "Science is Fun!" On October 23, 2014, Cazenovia College presented its third “Science is Fun!” program for local children and families on a very special day: Mole Day. This is not a day to celebrate a tiny mammal. Instead, Mole Day commemorates Avogadro's number: 6.022 x 1023 – the number used in chemistry to determine how many particles are in one mole of a substance. The theme of this year’s program was the chemistry of candies and polymers. At the beginning of the event, students presented a short play in which they assumed the roles of molecules (mers), forming a polymer to demonstrate how cross-linking “mers” helps in making slime, flubber or candies. Chemistry activities included: making glow-in-the-dark flubber and slime, studying properties of polymers used in diapers, poking a balloon and still having it inflated, floating M&Ms, learning to identify candies containing edible acids, and making tarnished silver shine again. Biology activities included identification of local freshwater creatures, such as fish, turtles, frogs and salamanders. The chance to observe live turtles, insects and a tarantula was also available at the event. Equine management students presented an Equine Anatomy Bingo game! The program, designed to promote fascinating aspects of science, fulfilled its mission. Hands-on activities intrigued and impressed both children and parents. As a bonus to the exciting event, WonderWorks’ Professor Wonder from Destiny USA gave 50%-off admission coupons to all participants. Event coordinators Dr. Venera Jouraeva and Dr. Thad Yorks thanked event sponsors: Division of Humanities and Natural Sciences, Cazenovia College Environmental Club, American Chemical Society, Cazenovia Candy Shoppe, and HAUN Specialty Gases. Special thanks to Dr. Carol Buckhout and her Equine Anatomy students for setting up the new and very popular Equine Anatomy Bingo activity, to Dr. Barb Hager and her students for providing live insects, and to the students in the Wetlands Ecology and Environmental Science classes for setting up stations on turtles, fish, salamanders, frogs, pine cones from around the world, and skulls of NYS mammals, and last but certainly not least to the General Chemistry and Science Is Fun students for leading all chemistry hands-on activities. Mole Day should be celebrated by everyone who appreciates science. It does not take a genius like Albert Einstein to realize that science inspires curiosity and creativity and that without science our world wouldn’t be quite as fun. Photo: Sophomore Biology Major, Jeremy Kuettel, from Oneonta, NY, and children from the local community enjoying the 3rd annual “Science is Fun” event.